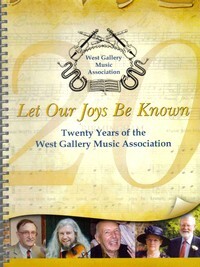 "The WGMA committee decided that the twentieth anniversary of its first meeting at Ironbridge should be marked by the publication of this Yearbook. Each quire known to be active has been invited to submit a page summarising their history and activities, and three pages of music intended to epitomise their own repertoire. Quires were encouraged to submit short items which could be easily learnt, and where possible of particular local origin or interest. Such items have been received in abundance. In the early days there were about half a dozen gallery quires, of which the earliest (The Madding Crowd) dates from 1975. More than thirty are now listed as having contributed to the present anthology, including one each from Australia and the USA. These quires deserve credit for the development of local, regional interest, by the successful regular events, and the concerts and workshops held in most parts of the country for the benefit of members and the general public." The book is coil-bound which will lie flat on a music stand. It has been specifically laid out to avoid page turns for instrumentalists and there is also a Bflat version. The new copies are on slightly thicker paper with stronger covers and a better binding so are stiff enough to hold conveniently. Cost: Members and Non-members, £8.00 + P&P. Please contact Charlotte Bailey, tel.01962 713392, or email: for postage costs before ordering. Have a look at the companion volumes West Gallery Harmony - Psalms & Hymns aka "The Red Book"
and West Gallery Harmony - Carols & Celebrations aka "The Green Book"